Earlier this year, we awarded a 3-year $1.2 million grant to Downtown Cleveland Alliance (DCA) as it continues its role as a driver of business and residential development in Downtown Cleveland. Since 2006, the foundation has continuously supported DCA as it works to make Downtown Cleveland the most compelling place to live, work and play. We recently sat down with Myron Marshall, a National Urban Fellow who has been working with the Program team here at the Cleveland Foundation, to ask him a few questions about what the foundation has learned from funding DCA over the years, and how this latest grant will continue DCA’s impact in the community. Downtown Cleveland Alliance has worked to attract businesses and residents to Downtown Cleveland for many years. What have we learned from its work? To start, we’ve learned that businesses will be more inclined to relocate to Downtown Cleveland if there are great amenities and a talented workforce. DCA’s marketing strategy – which includes a series of compelling YouTube videos (see below) – is targeting a younger, more vibrant crowd to live, work and play downtown. If you have young, talented people, you start to see new businesses being generated, new innovation and new things happening. You start to see change – 21st century change – that is desperately needed here in Cleveland. That’s what DCA is working towards. In addition to marketing, what steps has DCA taken to make Downtown Cleveland a more attractive location for residents and businesses? Through its research, DCA learned that cleanliness and safety were the two primary concerns of Downtown Cleveland residents and businesses. One of DCA’s most visible programs to address this has been its Ambassadors program. DCA’s Clean and Safe Ambassadors work 7 a.m. – 12 a.m. seven days a week providing a wide array of services. The Ambassadors clean up graffiti, walk people to their cars after dark, clean up debris and trash in the Cuyahoga River, help visitors navigate downtown, make the rounds checking in with businesses, and everything in between. 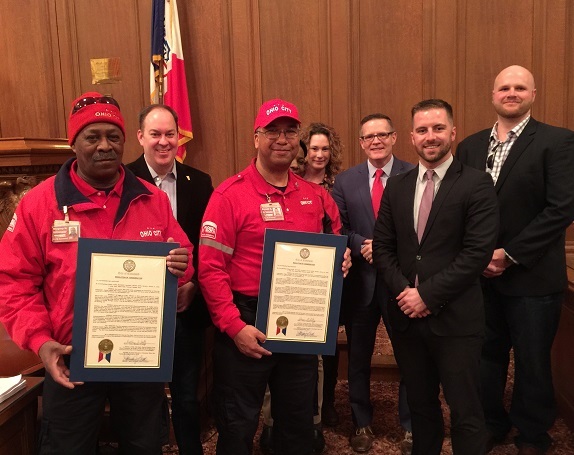 In fact, two DCA Ambassadors were recently recognized by Cleveland City Council for heroic actions rescuing and administering first aid to a young woman who had been abducted and shot by an acquaintance. From every day routines to extraordinary acts, the Ambassadors have truly changed the face of Downtown Cleveland. DCA Ambassadors are recognized for their heroic actions. One specific concern voiced by Downtown Cleveland residents and businesses was aggressive panhandling taking place around Public Square near the Jack Casino. To address this, DCA worked with Cleveland City Council to enact ordinances and other methods to mitigate panhandling on Downtown streets. DCA also recognized that most of the panhandlers were homeless, so they explored the root causes. Through their learning they found the reason many individuals don’t have housing is because they lack the required documents. So DCA has worked to help individuals navigate the system to obtain required documentation – birth certificates, IDs, etc. – to obtain housing. They’ve also enacted programs to help homeless individuals learn a marketable skill and find employment. For example, DCA’s SEEDS program, in partnership with Lutheran Metropolitan Ministry, offers specialized training in urban landscaping and planter maintenance, as well as soft skills needed for employment. Thanks to all of this work by DCA, parking and transportation have replaced safety and cleanliness as the top concerns for Downtown Cleveland residents and visitors. That’s really exciting! What is DCA doing to make sure Downtown Cleveland has the infrastructure to support a growing population? DCA has played a key role promoting the use of Federal Historic Tax Credits (HTCs) for development in the city. The credits, offered through a competitive process, encourage the rehabilitation of historic buildings into spaces that are attractive to organizations and residents, invite private investment and create local construction jobs. Cleveland has plenty of historic buildings, and nearly 40% of downtown residents live in a Historic Tax Credit building. Thanks in large part to DCA actively advocating for the tax credit, $77 million has been saved in total rehab and construction costs in Downtown Cleveland. With funding from this latest grant, DCA will continue its focus on infrastructure with a housing demand study and a transportation study. Tell us about this grant, and how it will build on the work DCA has been doing for more than a decade. This latest grant will support DCA’s continued business development and talent attraction efforts, strategic marketing campaign, its built environment and placemaking initiatives, and strategic partnerships with downtown CDCs – including Historic Gateway, Campus District, Warehouse District and Flats Forward. DCA has set a goal to encourage the growth of Downtown Cleveland’s population to 20,000 by the year 2020. That 20,000 number is significant because once that population density is reached, you start attracting major retailers and big box stores. And as I mentioned, the grant will also support housing demand and transportation studies, which will inform DCA’s development plan moving forward. So one last question: Why Downtown Cleveland? Cleveland has many neighborhoods that could benefit from this grant. 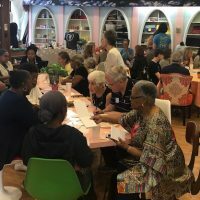 First of all, the foundation is providing significant funding to neighborhoods across Cleveland, including neighborhoods suffering from historic disinvestment and severe poverty. But we also know that cities need a strong core. Downtown Cleveland is the heart of the city, and when the city has a strong heart, it lifts everything else. When major retailers and businesses move in, jobs come with them and the economic impact radiates outward. It’s not theoretical – you can see this clearly when you look at other cities. Downtown Cleveland has come a long way over the years, but it hasn’t yet reached its full potential. 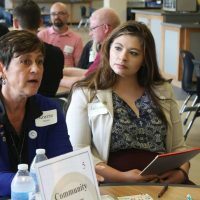 There’s still plenty of room to grow, and that’s exactly what Downtown Cleveland Alliance is focused on. With this grant, we’re investing in Downtown Cleveland Alliance’s proven track record of success.